Hello and welcome to Mac and Sons Professional Cleaning Services. We value this as a most important page within our website enabling customers an immediate knowledge of why our business exists, who has started it and what we would like to achieve for our customers in the future. Mac and Sons is a professional cleaning company providing a full range of domestic, commercial and industrial cleaning services to any type of property. 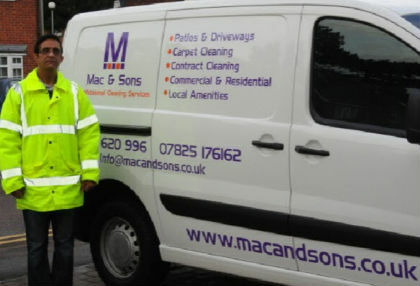 As a business, Mac and Sons has been built on a strong ethos of taking customer care seriously when undertaking customer cleaning requirements. With this in mind, many of our customers are still with us since we were established in 2007. Our main and foremost goal is to create a company where customers feel welcome, staff are happy to work and we can delivery high quality cleaning services. Today we clean a significant number of residential and commercial properties around Hitchin, as well as other areas across Hertfordshire. With this in mind, we strive to enhance our reputation with a great deal of business coming from recommendation and word of mouth from well served, satisfied customers. We are most delighted that you chosen to visit Mac and Sons and we hope to hear from you soon.